Imagine a land of huge sandy bays, coves and caves, hillsides carpeted with wild flowers, ancient, traditional, whitewashed villages baking in the hot sun, vast blue skies and lively seaside towns where the party never stops. Imagine fine wines and sardines grilled fresh from the sea, local cured hams and olive oil packed with flavour, an orange you picked from the tree…imagine the Algarve. Now imagine a beautiful villa with everything you need to be happy and comfortable, and a lovely, cool calm bedroom waiting for you after the heat of the day. Imagine swimming at dusk in your own private pool, planning the day ahead and marvelling at the day you have just spent in this magical place with the people you love best. You are imagining your Villa Plus holiday - it is all there waiting for you. The Algarve is an ancient land, where the Romans once built their villas and farms, but the Algarve as we know it today was created in the 60s when 3 golf-centres, upmarket and elegant resorts were created, near Almancil, just west of Faro. Known as the Golden Triangle, Vale do Lobo, Quinta do Lago and Vilamoura are synonymous with luxury living. These stylish, contemporary man-made resorts are places devoted to pleasure – and golf. The fabulous climate, superb beaches, great food and wine, as well as friendly, hospitable people make this area of Portugal irresistible when we are looking for a relaxed villa holiday in beautiful surroundings. You can enjoy a being in a small traditional fishing village as well as the action-packed nightlife of ever popular Albufeira. You can spend your time lazing by your own pool, or exploring the golden sands, ochre cliffs, coves and rock pools or the dramatic 125 miles coastline. Your children (or grandchildren) will have the chance to swim with dolphins at Zoomarine, try white-knuckle rides at the amazing water parks, or take a boat trip to explore spectacular rock formations, caves and secret beaches. With their own pool table at the villa, and WiFi to keep them in touch, they will never be bored! 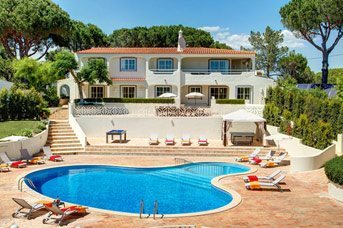 There are thousands of villas to choose from in the Algarve, but we think you would be happiest in one of ours – the clue is the Plus part of Villa Plus! It is all the free extras that make our villas extra special, and the special people we have working for us on the spot to ensure that your holiday is the best we can make it! Language is no problem when you have someone right there on your side, fluent in both English and Portuguese. Majority of our villas have air conditioning, so your nights will be cool and peaceful, and most of our pools are heated so you won’t get a shock when you take the plunge! Just tell us what you need, and we will find a villa and resort to suit you – perfectly. The Algarve is a land of contrasts, between ancient and modern, the simple grilled sardines and the Michelin starred fine dining, the lush rolling hills inland and the endless miles of golden sand and stunning cliffs of the coast. We have villas deep in the countryside and right on the coast, some perfect for big groups of friends, others ideal for a small family. If you just want to relax, you need never leave the poolside, but if you are keen to explore, there are fascinating Roman ruins, museums and historic churches. If you like an active holiday, there is every kind of water sport as well as top quality golf, tennis, riding and fishing. The landscape and light are an artist’s dream and if photography is your thing, you will be kept very busy! There is plenty here to delight a real foodie, and if you love wine, there are vineyards to discover, including the one owned by Sir Cliff Richard. If you love bird-watching, flora and fauna, you will be very impressed with the Ria Formosa Natural Park. Whatever your passion, we are sure you will love the Algarve! 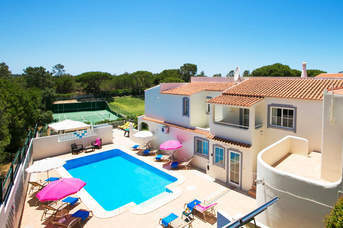 A villa holiday in Albufeira, the most popular resort in the Algarve, has it all. The lovely beaches and ideal climate combine with a rich history and culture to give a great all-round holiday experience. There is also a fantastic choice of shops, excellent sports, nightlife and a family-friendly atmosphere. It is the fabulous climate and magnificent beaches that draw people in their thousands to this part of the Algarve all year round. Villa holidays in Almancil offer the perfect chance for guests to recharge their batteries and simply relax. Armacao de Pera is a busy town, but not so long ago it was a small fishing village, and the old town retains its original character with winding alleys, tiny whitewashed cottages and a 16th-century chapel. Branqueira is situated in a residential area within a 5 minute drive from Albufeira, one of the Algarve’s most popular resorts, as well as a number of beaches including Olhos D’Agua, Falesia, Santa Eulalia, as well as Albufeira's Fisherman's beach being a short car ride away. Carvoeiro is a traditional, family-oriented pretty seaside town once a thriving fishing village. Villa holidays in Carvoeiro revolve around lovely sandy beaches set beneath towering dramatic cliffs, whilst excellent shops provide a bit of retail therapy and numerous bars and restaurants offer evening entertainment. Castelo has a picturesque sandy beach nestled prettily at the foot of sandstone cliffs with a popular restaurant overlooking the sea. In the resort, you’ll find a small selection of shops and a choice of restaurants. Fort Sao Joao is a pleasant small holiday resort in The Algarve with a good sandy beach, located in between the resorts of Praia d'Oura and Albufeira. The remains of Atalaia and Quinta da Torre can be seen in the area which were medieval watchtowers used to give warning of attacks by pirates. Gale is centred around its 2 Blue Flag beaches, each surrounded by rock formations which create sheltered bays ideal for swimming and paddle boarding. Each has a choice of restaurants where you can try freshly caught fish while enjoying the sea views. Guia is a small, traditional Portugese town famous for its piri-piri chicken. From admiring sand sculptures to exploring water parks, Guia villa holidays are great for exploring, if you fancy a spot of indulgence there’s also fine dining and wine tasting to enjoy. A villa holiday in Lagos, the third largest town in the Algarve offers cobbled streets, medieval city walls, excellent shops, bars and restaurants, an impressive marina and glorious beaches. Set in the hills overlooking the Algarve coastline, Loulé is a historic town with a great deal of charm and character. 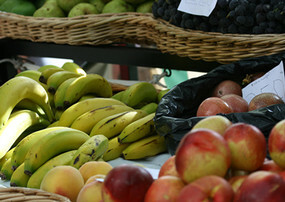 Browse the daily local market for bargains or spend time people watching in one of the cafes on the Avenida. For culture lovers, the castle and Gothic churches are a must see. Luz was a fishing village until the 60s, and is now a well-developed, family-oriented resort with a fabulous beach perfect for your villa holiday. Quinta do Lago is a purpose-built, very exclusive resort with luxury villas in a beautiful, setting with 4 golf courses, a spectacular beach, lakes, rolling hills and pine woodlands on the edge of the Ria Formosa Natural Park. Sao Rafael is a small seaside village, retaining its natural beauty and charm with a sheltered beach and a small selection of friendly bars and restaurants. Vale do Lobo is 1 of the 3 golf-centred, upmarket and elegant man-made resorts known as the Golden Triangle, near Almancil, just west of Faro. Luxurious and contemporary, Vilamoura is a large, stylish man-made resort with a stunning marina and two excellent beaches – it is a place devoted to pleasure. The Algarve is the southernmost region of mainland Portugal. The large selection of picturesque sandy beaches, fantastic choice of shops and restaurants - many selling local produce - beautiful scenery and a number of different leisure attractions and sports make the Algarve one of the most popular tourist destinations in Europe. There are many kinds of boat trips on offer - for dolphin watching, deep sea fishing, sightseeing and Champagne breakfast trips, for example, and the only way to appreciate the fascinating limestone rock formations is by boat. The amazing grottos, arches and caves have intriguing names such as Love Grotto, Cathedral, Elephant and Ghost. One company offers a two hour trip heading out to sea in a small, fast boat in search of wild dolphins, and then explores the dramatic caves and rock informations. Or you could opt for a full or half day cruise in a lovely, large catamaran or yacht, boats with excellent comfort and stability. The full day tour covers 40 miles and the half day tour 23 miles of the Algarve's picturesque coastline taking in beautiful beaches,fishermen's villages, seaside towns, impressive rock formations, cliffs and some of Europe's largest caves. A kayak ride inside the caves is included as well as a barbecue lunch on a secluded beach. Whichever villa you choose in the Algarve, you are not far from a championship golf course. Autumn and spring are the key seasons for golf here. Although courses are fairly relaxed on the sartorial front, you will be expected to wear golf shoes and a shirt with a collar on. Golf is big business with 36 courses for golfers of all levels. Vilamoura is world famous for golf, and frequently hosts international tournaments. There are five 18-hole championship golf courses, mainly north of the town, including Oceanico Victoria, host of the Portugal Masters since 2007 (you will need to show your handicap certificates if you want to play). Despite the newer courses in Vilamoura, for many visitors the Old Course is still the best, presenting just the right level of difficulty for the enthusiastic amateur. Almancil is a brilliant holiday location for golfers, with five championship courses on your doorstep. There are two world class courses at Vale do Lobo. The scenic Ocean course was designed by British golfer Henry Cotton over fifty years ago. The fairways run alongside the nature reserve before leading gently down to the sea shore. The Balaia Golf Village 9-hole course offers six outdoor pools, a gym and two restaurants, as well as a health club with a hot tub, Turkish bath, massage treatments, and aromatherapy and hydrotherapy sessions. How brave are you? Could you cope with the Kamikaze, the highest water slide in Portugal, plunging 36 metres in just four seconds?Aqualand in Alcantarilha is dare-devil heaven, but offers a gentler experience for tiny tots and those looking to relax. There is a mixture of water slides of all different shapes and sizes, from white-knuckle rides to the children’s water playground. The Anaconda is popular, with five tubes snaking different routes down to the base pool. One of the newest additions is the Banzai Boggan on which visitors slide down what feels like a sheer drop from a height of 23 metres. If you are all tuckered out you can meander down the Congo River on a doughnut ring. For children, Rainbow Beach offers mini slides and mushroom showers. You can watch them splashing about in shallow waters from the comfort of a sunlounger on one of Aqualand’s many sun decks. Slide and Splash is a very clean and well-designed water park open from 1st of April until the end of October. There are some pretty exciting rides including the Tornado - a vertiginous descent at high speed that ends in a huge splash – and the Black Hole. There is also a huge pool. There is more to Slide and Splash than water – for example there is a free Falconry Show involving eagles and hawks, a colourful aerobatic Get there early and if possible pre-book your tickets to beat the queues at peak times. A typical comment from our customers is, "An absolutely brilliant day out and highlight of our stay this year." The Algarve is a holiday paradise for water sports including swimming, sea fishing, snorkelling, waterskiing, parascending and jet-skiing. Consistent all year Atlantic swells make many beaches in the Algarve ideal for surfing, windsurfing, kitesurfing, wakeboarding, bodyboarding and paddlesurfing. If diving is your thing, you don’t need a second mortgage to take a short course at one of the local dive centres. At Gale, towards Albufeira, there are pedalos and banana boats for hire, and there is a well-equipped watersports centre at Armacao de Pera, the Algarve’s largest beach. Vilamoura is awash with water sports - choose between jet skis, parasailing, a banana boat ride or a gentle pedaloe ride. You could opt for swimming, sea fishing, snorkelling, waterskiing or parascending. The main thing you need to know about this beautiful marine-inspired theme park is that you can swim in the pool with trained bottlenose dolphins and learn how to communicate with them, how about that for an unforgettable holiday experience! Zoomarine is in Guia, just a few kilometers from Albufeira, and is huge! There are themed presentations with dolphins, seals and sealions and an amazing aquarium with sharks and examples over 20 aquatic ecosystems! Birds play a starring role at Zoomarine, and you can see tropical birds such as macaws, parrots and cockatoos as well as birds of prey such as falcons, owls and eagles. Be sure to take a cossie and towel if you want to try the new Zoomarine Beach, an area with a WaveBeach, water slides and swimming pools. There is also a 4D cinema, outdoor pools and green area, a big wheel, pirate ship ride, flume ride and mini-roller coaster. The Algarve is renowned throughout Europe for its stunning beaches, from soft sand, ample facilities and a vibrant atmosphere to more secluded beaches with caves, rock pools and beautiful scenery, the Algarve has something for everybody. Where possible we provide information to each beaches popularity, the water sports on offer, and the proximity of toilet facilities, car parking,shops and restaurants so that you can decide on its suitability for your group. The majority of beaches are easily accessible by car from the main N125 road. In the summer,August in particular, almost nowhere is quiet, whilst in off-peak months the crowds fade away. Around the beginning and end of season, some of the restaurants and facilities in the area will also close. Please also take note of the Portuguese flag system: a red flag means bathing is forbidden altogether, a yellow flag indicates that swimming is forbidden but sunbathing is safe, a green flag means that swimming and sunbathing are safe. This is a sandy beach ideal for picnics, frisbee games and sunbathing. There are also shops, restaurants and a nightclub nearby plus plenty of room for parking. Reach Praia da Oura by driving east of Albufeira for a mile and a half. With the bullring on your right, take a right at the roundabout on the road towards Olhos de Agua. At the end of the shopping, restaurants, etc at another roundabout turn left. Shortly after, the beach is signposted on the right. The beach is a short distance from the car park. Accessed by either steps, a boardwalk or by escalators, Fisherman's Beach in Albufeira is ideal for all ages with shallow water and fine golden sand. Watersports facilities are available and the beach is lined with cafes and shops, with the old town of Albufeira also within easy reach on foot. Forte Sao Joao is a small resort nestled between Albufeira and Praia D'Oura. The beach is a short walk from the resort centre and has beautiful golden sandy and green headland, or if you prefer to drive, there is plenty of parking available with steps and a ramp to access the beach. The water becomes deep quickly but lifeguards man the beach in high season. There is a choice of restaurants and cafes along the beach and sunbeds and parasols can also be hired - perfect for a lazy day soaking up the sun! To locate the Forte Sao Joao beach, follow the coastal road from Albufeira to Praia D'Oura. About a mile along the road is Concha restaurant on the left, turn right here. Follow the road downhill and the beach is on the right next to Forte Sao Joao Beach Club. Praia do Lourenco Beach is located between the resorts of Gale and Sao Rafael, part of a succession of great beaches along this stretch of coast. The beach is small but is a sheltered cove with shallow rock formations and rock pools for exploring. There is a good restaurant overlooking the beach and a small parking area with a wooden walkway down onto the sand. This is an excellent sandy beach for avid joggers, walkers and swimmers as it is one of the largest in the Algarve. Take a romantic stroll at dusk or run off unwanted calories at dawn without having to double back on yourself. The beach has sailboard rental outlets and water-skiing lessons plus many laid back restaurants and beach bars. Leave the N125 at Odeaxere or at Lagos Bridge and follow the signs to an abundance of parking spaces. This sweeping bay in Lagos benefits from easy parking and several beach bars and restaurants. Turn off the N125 on the western outskirts of Lagos. Also known as Praia de Almargem, the beach is in the Fonte Santa district on the road from Quarteira to Almancil. Alongside the beach and separated by sand dunes is a small lake. There is a small bar and keen walkers can walk along to Vale do Lobo or Quarteira, depending on the tide. Drivers should turn left at the traffic light travelling from Almancil to Quarteira. The beach is signposted from here and is about three minutes drive through a residential area and pine trees. Noted for its golden sands, rides, windsurf hire and restaurants. Lifeguards are on site. The western end of the beach has a bar/restaurant whilst the eastern end, over some rocks, is quieter. Smaller beaches can be accessed along paths and over rocks with the red and cream cliffs of Falesia visible in the distance. Reach Praia da Oura by driving east of Albufeira for a mile and a half. Take the road to Club Praia da Oura. To avoid the centre of Albufeira turn left at the crossroads on the outskirts as you approach from Ferreiras. One of the finest cove beaches in the Algarve, Castelo is isolated and surrounded by breathtaking rock formations. The beach is only a short walk from the resort centre or easily accessed by car, with steps and a ramp onto the sand. The water becomes deep quickly but lifeguards do man the beach in high season. There is a good cafe which overlooks the beach out to sea and sunbeds and parasols are available for hire. Coelha is a pretty cove beach with dark green waters and is superb for snorkelling. Its width offers a lot of space for picnics and the rocks are good for fishing and exploring. The peace and quiet provided here is a perfect contrast to the hustle and bustle of Albufeira which lies 3 miles to the east. Proceed west to the top of hill where you will come to the Dolphin roundabout. Follow the signs for Sao Rafael. Continue on the coastal road from Sao Rafael to Gale. Pass Dom Dinis restaurant on your right. Shortly after this, turn left passing the restaurant OMarinheiro. Follow the road to the car park. There is a ten minute walk to this lovely cove beach with its beach bar serving drinks and snacks. This unique beach is reached by a long drive through pinewoods followed by descending steps cut into the naturally sculpted red and cream cliffs.The red and cream cliffs make you think of raspberry ripple ice cream which can be purchased in the beach bar/restaurants. The beach is lined with Caribbean-style thatched wooden sun umbrellas and is recommended for swimming. You can walk in either direction for as far as the eye can see. Car parking is easy and lifeguards patrol in season. Drivers should turn off the Albufeira to Quarteira road for Olhos de Agua and then turn left for Alfa-Mar before finally turning for Praia da Falesia. You can also reach it by heading just west of Vilamoura Marina. Part of the huge stretch of sand East of Armacao de Pera, this beach has a lot to offer. It is distinguished by the large turtle-shaped rock at its easterly point. The beach is easily accessible on foot from the resort centre, or by car with ample parking available. Steps and a ramp lead down to the beach. The water is shallow, great for kids, with lifeguards in high season. Sunbeds, jet ski and water skiing facilities, parasols and pedaloes are all available to hire and there are numerous cafes and restaurants to choose from. Drive from the N125 at Alcantarilha through Pera and follow signposts. It is within 4 miles of bustling Albufeira. Four miles to the west of Lagos, Praia da Luz is a thriving family resort. The long wide sandy beach flanked by dark headland cliffs is well known for its fishing, snorkelling, windsurfing, paddle boating and sailing school open June to September. Luz has a variety of shops, restaurants, bars, nightclub and charming cobbled streets and is a paradise for those looking for plenty to do and see. Flags and lifeguards offer safety in season. Limited parking spaces back onto the beach and toilets are located nearby. Access Luz from the N125 at either Espiche or at a turn-off under two miles to the east of Espiche. This is a relaxing sandy beach to the east of Sagres Point sheltered and amply served by beach bars and restaurants. Car parking is very close to the beach and lifeguards are on patrol in season. Boats and fishing trips are available. This is an ideal beach to have lunch when visiting Cape St Vincent about two miles away. Nearby Sagres is an historical town full of Portuguese character and a stroll to the east of the beach reveals a harbour and to the west a fort. Praia da Mareta is accessed by turning off the N268 eastwards at Sagres Point. This is one of the best and most surprising beaches in the area. Hidden from sight until you walk along the cliff top path, the sandy beach then stretches away from the attractive honeycomb cliffs. At the western end an opening through the cliff reveals an interesting secret cove. Relatively quiet because of the lack of surrounding development, the beach is a walk down steps. It is however well provided for with lifeguards, car parking, a beach bar/restaurant, windsurfing hire and boat trips during peak season. Marinha beach is reached either by leaving the N125 at the International School east of Lagoa, or by travelling east past Benagil. This beach is easily accessed and has good facilities and activities plus a diverse landscape. Beach bars and restaurants are plentiful with windsurfers and sailing boats available for the energetic. The beach is long relaxing stretch of sand that meets gold and scarlet coloured cliffs sheltering a small cove called Tres Irmaos. At the Lagos end of the beach at high tide visitors can only reach the next bay in a small craft – an adventurous prospect. The beach can be reached by car directly from the N125 road east of Lagos or via Praia da Rocha. At the Armacao de Pera resort cliffs give way to a sandy beach that stretches for miles to the east. The first stretch of beach is excellently provided for with car parking along the front, lifeguards and flags, bars, fish restaurants, sun umbrellas for hire, water sports and good roads along the coast or towards the N125. If visitors fancy some peace and quiet they can walk along the beach or drive easterly through the village of Pera after leaving the N125 at Alcantarilha. A wide sandy beach that stretches away from the village of Ferragudo. As you follow the beach south the view changes spectacularly from riverbank to open sea as the estuary of the River Arade opens up. Windsurfers, sailing boats and water skis can be hired from the water sports school or take advantage of the estuary for a spot of fishing. Nearby is Portimao harbour, toilets and a beach bar/restaurant. Lifeguards are on patrol and car parking is close by. Ferragudo is also close to Praia da Rocha one of the Algarve’s most famous beaches. Access to Ferragudo is from the N125 just east of Portimao Bridge. Overlooked by a colourful fishing village, Salema’s sandy beach has terrific facilities giving visitors of all ages everything they need for a day out. Enjoy the restaurants on the beach where there is limited car parking, toilets and lifeguards all on hand. Sun-loungers can be hired in peak season. It is a pleasant destination in the off-peak season as facilities are open yet not overcrowded. Salema is accessed by turning off the N125, two thirds of a mile west of the town of Budens. The first pretty cove beach of note to the West of Albufeira, Sao Rafael combines sand and rock in good proportion. The beach can be accessed easily on foot from the resort centre, or by car with ample parking available, with steps leading down to the seafront. The water does become deep quite quickly but lifeguards do man the beach in high season. Parasols and sunbeds are available to hire and there is a restaurant where you can enjoy a drink or a meal as a break from the sun! The beach is accessible from the EN 125 just West of Albufeira. Praia de Vilamoura is the stretch of sandy beach located adjacent to the marina in the heart of this very popular resort. Very central this beach is within easy walk to the marina with its shops, bars and restaurants. Watersports are available during the summer months and whilst parking is available it does get busy. Our Villa Merlo (www.villaplus.com/villamerlo) is within walking distance of this beach. Situated beside the Vale do Garrao beach heading towards Quinta do Lago this is a long stretch of sandy beach which is easily accessed and has good parking facilities. The beach has a couple of small restaurants. Beach umbrellas and loungers are available to hire. To reach Ancao beach take the turning next to Pinetrees riding stables on the main N125 road. This small sandy cove lies beneath Benagil village, perched on the cliff tops, with colourful fishing boats and rugged landscape making for great views. The beach opens out into a sandy stretch to the east and fishing or boating trips can be arranged. Half way up the steps to the village is a bar/restaurant. There is car parking and during the season lifeguards are on duty. Benagil is accessible from the N125 either from Lagoa or two miles to the east from the International School. It can also be reached on foot across the headland from Alfazina if you have visited Carvalho 'smugglers beach' from Carvoeiro. This fishing village oozes character with streets winding down to a flat secluded beach. Marine blue water meets the cliffs where the whitewashed village is perched. The golden sand is ideal for sunbathing and beach games. Gentle waves welcome swimmers and the deeper water is good for diving and snorkelling. Children can play on nearby rocks under the watchful eye of adults at the large beach bar. Praia do Burgau can be reached from either Almadena on the N125 or along the coastal road from Praia da Luz. It is sensible to leave your car at the top of the village and walk down to this quiet haven. Known locally as 'Smugglers Beach', Carvalho beach is a natural jewel in the Algarve coastline. Access is through one of the two natural tunnels in the cliff and down some steps. This is definitely a beach for adventurers. Caves carved out of the cliff walls above the beach can be explored by climbing steps and going through a passageway and a small island is only a short swim off shore. The beach is also topped by a lighthouse. A car park and toilet facilities are fairly nearby. Carvalho is two miles east of Carvoeiro which is accessible from the N125 at Lagoa. Follow the signposts to Alfanzina – it is at the end of the Club Atlantico development. Lots to enjoy on this long stretch of sandy beach. Watersports are available during the summer months or unwind at the variety of restaurants and beach bars with musical entertainment. Take the road that leads to the Ria Park Hotel, go past the hotel (on your left) and take the first turn left. Plenty of space to park. Praia do Martinhal is a flat sandy beach to the east of Sagres harbour. Backed by sand dunes and cliffs it is ideal for exploring. The calm sea makes it suitable for bathing. Visitors can watch or participate in windsurfing. The beach has a peaceful atmosphere and is suitable for young children, the elderly and family picnics. Bars, restaurants and a motel overlook the sea. Praia do Martinhal is accessed by turning off the N268 eastwards, 4 ½ miles south of the town of Vila do Bispo. Situated to the west of Sagres Point this small sandy beach nestles in a bay between interesting rocky outcrops. A beach for the playful, it benefits from rolling Atlantic waves pushed in by western winds. Take care when swimming as this is a very popular surfing beach. The area is picturesque and is a great place to cool off on a drive to Cape St Vincent. Rock pools keep the children busy and bar/restaurants are within easy reach. Nearby Sagres is an exceptionally pretty harbour town. There is limited car parking along a sandy track 20 yards away. Find the beach by turning off the N268, which is a continuation west of the N125. One hundred and fifty steps descend to the beach with the beach becoming visible half way down. One of the most attractive and exciting beaches in the Lagos area, Dona Ana is reached by steeply descending cliff-side steps which make you feel away from it all. Another small adjacent bay as wide as its cliffs are high, is accessible at low tide and offers great shelter from the sun’s hot rays. Cornish holidaymakers will feel at home surrounded by this rugged landscape. The intrepid can explore caves and grottoes on a boat trip and scuba diving and snorkelling (with your own equipment) is available. There are a number of bars and restaurants to relax at. Lifeguards are on patrol. The beach is relatively small and gets very crowded in high season. Follow the signs to Dona Ana as you drive west out of Lagos and park near the Hotel Golfino. Situated in the Praia D’Oura area of Albufeira this tiny but perfectly formed beach with its small rock formations is excellent for scuba diving. There is a small beach bar. The beach is situated beyond 'Kiss Disco' and is accessed by taking the first left turn before you come to the Hotel Auramar. Follow the road to the end and turn right when you see the signpost. Parking is in a car park with a walk to the beach. Praia dos Caneiros is a popular beach which nestles between honey-coloured cliffs and is overlooked by the Ponta do Altar lighthouse. If visited in the winter it offers seclusion and great scenery. Low tide opens up a smaller beach beside the lighthouse – excellent to explore and keep the kids busy. Car parking and bar facilities are available. The beach is accessed by leaving the N125 just east of Portimao Bridge and driving two thirds of a mile past Ferragudo village. Tranquility begins as you leave the Albufeira to Quarteria road towards Olhos de Agua. You then take a right along a sandy track and meet the serene Maria Luisa beach where cliffs and pines on three sides add to the peaceful atmosphere. There is a large car park, lifeguards that patrol in season, bar/restaurants and views down towards Faro. Sun-shades and loungers are available to hire. Eastwards walkers can explore large rocky beaches. Olhos de Agua or 'Freshwater Beach' is a great family beach with good sand and swimming. The fishing village nearby has pretty houses, bars and restaurants, boat and fishing trips, good car parking and lifeguards on site in season. To the west are a number of secluded coves to explore each with its own caves and attractive cliffs. The village is signposted along the main Albufeira to Quarteira road (turn off at the Bull Pub). It is also signposted from Falesia. This is an ideal place for surfers, windsurfers and spectators who like to watch their energetic feats. Conditions are perfect and there is a large tidal lake. A long stroll is recommended along the sandy stretch of beach which is backed by dunes and fringed with pine trees. Visitors have a choice of bars and restaurants and there is a water sports centre, lifeguards and good car parking facilities. Quinta do Lago is located off the N125 just south east of Almancil. Also known as Paradise beach, Centianes beach is set in a stunning location and is perfect for swimming. There is a bar/restaurant in a small grotto to its rear and another bar at the bottom of the steps that descend to the beach. Although car parking is quite limited, Centianes is worth a visit for the canoe hire and the exposed, interestingly formed honeycomb rock - a natural work of art. Reach the beach by leaving the N125 at Lagoa and driving 2 miles East after Carvoeiro. In true Caribbean style this sandy beach is lined with pinewoods and permanent wooden thatched sunshades. Visitors can enjoy feeling the waves break around their feet as they stroll the length of this extensive strand. Water sports, lifeguards, bar/restaurants and car parking are available. The beach is located off the N125 just south of Almancil. As with the rest of Portugal, the Algarve is home to some exceptionally tasty dishes. Blending traditional Iberian influences with its own take on cuisine, the Algarve is renowned for its food and the restaurants that serve it all up to you. Whether you stop into a Casa de Chá (a teahouse that serves up herbal and black teas along with a usually impressive selection of cakes) or a Fumerio (a smokehouse that serve up cured pork and cheese with oil and cornbread), the Algarve will have a tradition that undoubtedly suits your mood. As a coastal destination, the Algarve is a definite favourite with fish lovers, fresh catch-of-the-day dishes are readily available in the towns. 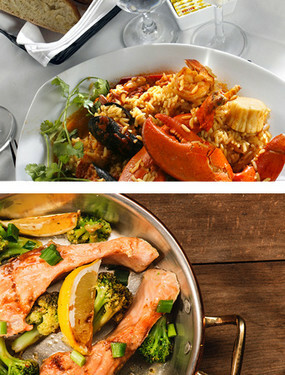 It's not just a destination for fish lovers though, with tender meat and delectable vegetarian delights on the menu too. Sit-down restaurants and cafés aren't the only way of life in the Algarve though, as the Portuguese destination is home to lots of markets, selling all manner of foodstuffs. The markets and their locations are listed in more detail in the Villa Plus guide to the Algarve, but rest assured that markets occur in the Albufeira, Faro, Lagos, Loule, Monchique, Portimao and Silves. These markets sell everything from freshly-caught fish to fruit, vegetables, and meat, and often feature vendors selling prepared goods too that make an excellent lunch. Portugal is home to many speciality dishes. From spicy chicken to offal stews, the Algarve serves up all its culinary delights with panache. Though the pace of life (and usually the table service) can be a little slower than you may be used to, the Portuguese relax when it comes to their food and enjoy eating – to fully enjoy the cuisine on offer in the Algarve it's worth bearing this in mind. 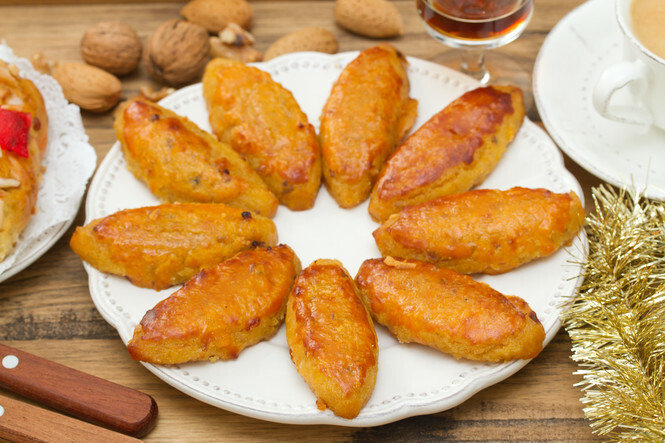 Chicken Piri Piri – worlds away from what we eat under the same title in the UK, the Portuguese piri piri is cooked on open flames, and comes with a bit of a kick. It's usually served with salad and rice or potatoes. Cataplana – a one-pot dish that consists of an array of seafood, namely mussels, clams, prawns and fresh fish, rice and potatoes. Very filling and very tasty! Feijoada – don't let the ingredients put you off of this dish. Yes, the feijoada contains offal, but it's cooked with pork, beans and tomatoes, stewed into a lovely thick sauce. It's usually served with bread or rice, and is definitely an experience to try once you're here. Why not liven up your home-cooking and try some Portuguese cuisine before you explore the country for yourself? It's not all spicy food, and even if it is, the native dishes are easy to recreate for yourself at home. For a main meal, you could try piri piri prawns and couscous, with a delicious broa castelar (sweet potato cookie) for a tasty treat after. It may be an intimidating list of ingredients if you've not worked with spices much before, but the method of preparing the dish couldn't be easier. By blending all of the ingredients except the prawns together, you create a nice piri piri sauce. Next, rub this over the cleaned and de-shelled prawns before leaving them in the fridge for an hour or so to marinate. After the hour, cook the prawns on a really hot griddle or frying pan. 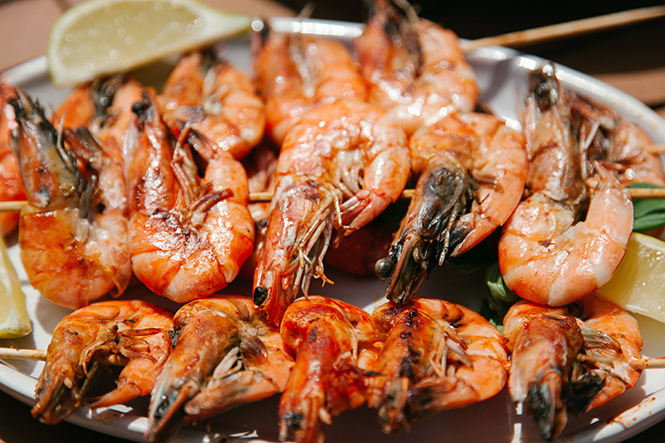 Allow around 5 minutes for each side of the prawns, though cooking time will greatly depend on the size of the prawns. Serve up with couscous and a dash of leftover lemon juice – incredibly tasty and quick to make, too. Firstly, be sure to cook your peeled sweet potatoes – you can do this by boiling them on a medium heat with a pinch of salt until they're soft. Once the potatoes are cooked, add the sugar to the pan (including the water) that they are sitting in. Stir whilst this mixture simmers until it reaches a puree like consistency, then take the pan off of the heat and allow to cool for an hour. Then, add all the other ingredients, minus the flour and two additional egg yolks. Place it on the heat again and mix well until the mixture boils. At this point, you can add the flour – on mixing it should be a smooth, even and thicker in consistency. Pour the mix onto a floured sheet, and allow to cool once more. Now you can mould the dough into the traditional cone shape, before brushing with the beaten yolks you've saved. These cookies cook at 180 degrees Celsius for around 15 to 20 minutes, and should look golden brown when cooked.